Bachelor / Bachelorette Limo Party Bus is what we strongly recommend, the place and the means to get around on that night would be inside our luxury party bus. Everyone is invited. All aboard!!! Prom Limo Transportation for NJ Every year we provide the finest prom limo service in New Jersey, New York & Philadelphia. Sweet Sixteen Limo Happy Birthday & Sweet Sixteen, get the party started right!!! 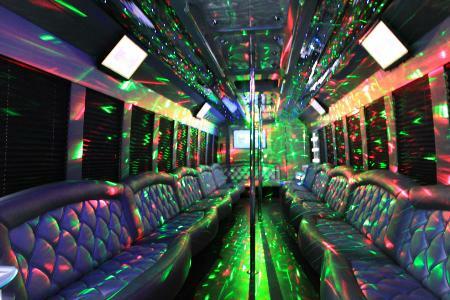 A stretch limo or a party bus to fit everyone and start the action as you board our most luxury party bus. Anniversary / Birthday Limo Planing a day at the Spa? Maybe shopping as well? Limo rental for your anniversary or birthday can really let you enjoy the day. No need to drive and park, and don't ruin your nails. Anniversary Limo, Birthday Limo Packages & Gift Certificates are available..
Winery / Private Tour Take the finest wine tasting tour, and indulge yourself with knowledgeable & experienced tour guide. Visit the vineyards & enjoy the atmosphere. Wine Tasting Limo Packages are available for Gift Certificates and Group Wine Tours. Casino Limo RentalsLucky 7! We wish you all the luck in the world! Travel to the casino the rich & famous way, think big, you deserve to win! Casino Limo Tours, Casino Limo rides, one way or round trip, weekly & monthly packages. SUV Escalade Limo SUV Limo, Hummer Limo, Escalade Limo, Expedition Limo, Infiniti Limo, Mercedes Limo, BMW Limo, Rolls Royce, Bentley, Audi, Cadillac, Party Bus. Airport Transportation Newark Liberty International Airport, located in Newark & Elizabeth, NJ. EWR Airport Transportations is available for airport transfers between LaGuardia and Kennedy Airport, Cruise Terminal Cape Liberty, Manhattan New York Cruise terminal and Brooklyn Cruise Terminal.